I know this is a bit early, but for my readers in Australia and the Philippines, you can treat this as a Vigil :-). 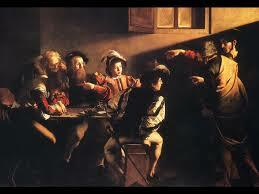 September 21 is the Feast Day for St. Matthew, one of the twelve apostles. Interestingly, St. Matthew is the favorite apostle of my nine-year old son, primarily because he was the one with the money 🙂 (Yes, we have some work to do). Matthew, who is called Levi by Mark and Luke, was a 1st-century Galilean (presumably born in Galilee, which was not part of Judea or the Roman Iudaea province) and the son of Alpheus. During the Roman occupation (which began in 63 BC with the conquest of Pompey), Matthew collected taxes from the Hebrew people for Herod Antipas, the tetrarch of Galilee. His tax office was located in Capernaum. However, as a tax collector he would have been literate in Aramaic and Greek. Matthew is spoken of five times in the New Testament; first in Matthew 9:9, when called by Jesus to follow Him, and then four times in the list of the Apostles, where he is mentioned in the seventh (Luke 6:15, and Mark 3:18), and again in the eighth place (Matthew 10:3, and Acts 1:13). As the account in the three Synoptics is identical, it is presumed that Matthew and Levi refer to the same person, although this is disputed. Levi could have been his original Jewish name. This is indicated by Matthew’s gospel referring to the tax collector as someone “named Matthew”. It was quite common for Jews to have two names. He is not mentioned in John’s gospel. From very early times Matthew has been traditionally regarded as the author of one of the four gospels, to which both Irenaeus and Papias, early Christian writers, give witnesses. This gospel was written in late in the 1st century and, based on similarity of material, is presumed to be dependent on Mark which is believed to have been the first gospel to be written. It is a very Jewish work and is clearly directed to Jewish converts. The original is thought to have been written in Aramaic or Hebrew although we now only have the Greek version. Matthew’s gospel (in contrast with Mark) concentrates a good deal on the teaching of Jesus and for that reason was used widely in the Church for catechetical teaching. Each of the four evangelists is represented by a symbol taken from the Old Testament. Matthew is represented as a man. This is because the genealogy he places at the beginning of his gospel speaks of the human ancestry of Jesus. One tradition says he went to Ethiopia and preached the Gospel there, confirming his teaching with many miracles. Because of one of his greatest miracles, that of bringing back to life the king’s daughter, the king and his wife together with the whole country became Christians. When the king died, his successor Hirtacus wished to marry Iphigenia, the daughter of the former king. But she had vowed her virginity to God and would not change. Because the vow had been taken through Matthew’s influence, Hirtacus had Matthew killed. It was believed that this happened on 21 September, hence the date of his feast. However, the Martyrology of Jerome says he died at Tarrium in Persia and others at Tarsuana, east of the Persian Gulf. What are claimed to be his relics were brought to Salerno in Italy by Robert Guiscard from Finisterre in Brittany where it is said they had been originally brought from Ethiopia. Later, under Pope Gregory VII, they were transferred to the church dedicated to St. Matthew. In art, Matthew is represented as either an evangelist or an apostle. As an evangelist he sits at a desk, writing his gospel with an angel guiding his hand or holding an inkwell. As an apostle he is shown with the emblem of martyrdom – a spear or sword or lance. He may also be shown holding a money-bag, representing his original profession. In the later Middle Ages he may even be shown wearing glasses, to help read his accounts! This entry was posted in Uncategorized and tagged America Magazine, Apostle, Bible, Caravaggio, Catholic, Christian, Feast Day, New Testament, Pope Francis, Rome, St. Matthew. Bookmark the permalink. Thank you Julie. The Caravaggio is solely the result of the Pope Francis interview. Before yesterday, I was not familiar with the painting (I had seen it but I knew nothing about the painter or its history). My knowledge and aptitude of art is extremely limited, but I do enjoy it very much, which is one of the reason why I like your blog! Have a fantastic Friday and weekend! The quote from Pope Francis speaks of his deep humility. St. Matthew must also have learned humility as he was willing to give up his lucrative income as a tax collector and follow Jesus. That would not have been an easy decision. We are also called to a life of humility which, I feel, is only possible when we know that we are sinners who are loved unconditionally by the Lord of the universe. Thank you for this reflection.